it started in the late '60’s. I was a University of Florida journalism student majoring in Public Relations who discovered a passion for photography and design along the way. To this day I haven’t seen much better. And it continues to inspire me to provide clear, concise marketing concepts to my clients. Before desktop publishing replaced tradition and craft, print’s golden era meant memorable layouts that led with provocative headlines and arresting copy from legends like David Ogilivy and Leo Burnett. 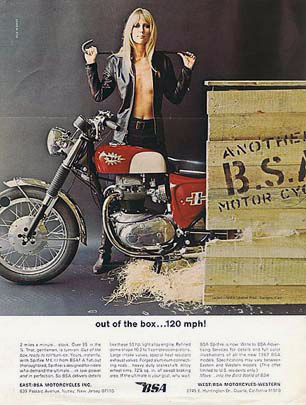 When I saw this ad for a BSA Thunderbolt, juxtaposing a sleek, pre-silicon model in the role of a crowbar-wielding setup mechanic, it fired my interest in the magic of advertising and marketing. Swapping event coverage at nearby race tracks like Daytona, Sebring, and Gainesville Raceway for a press pass and a few inches of bylined copy in the student paper got me close to the action and provided an opportunity to practice my craft in multiple dimensions. In the years since, digital media has dethroned print but not inspiration. I’ll hang on to that yellowing page as a reminder that no matter how clever the technology, without creative there is no message.